Baxter Black horses around with Azul at his Benson ranch. A few days ago, through complicated algorithms, YouTube suggested to me a poem titled, “A Vegetarian’s Nightmare.’ It was one clip, from a long list of Baxter Black poems, songs and stories. The poem’s rhythm, rhyming scheme and double entendres struck a chord with me. Several days later, I felt like I had seen everything the internet could offer on Baxter Black. I went to his website and contacted his secretary to set up an interview. I wanted more Baxter Black poems. I was truly excited to speak with him due to his talents, his unique niche of a career and the fact that he had been on the Johnny Carson Show multiple times. After speaking with Baxter, I would be only one degree away from the eminent Johnny Carson. In addition to television appearances, he was featured on National Public Radio for 20 years and has been writing three to four columns a month for over 30 years. Black has written around 30 books, which range from poetry, philosophy, novels and self-help books. One of his self-help books, “Lessons from a Desperado Poet: How to find your way when you don’t have a map, How to win the game when you don’t have the rules, And when someone says it can’t be done, it means they can’t do it,” offers 118 life lessons. “Remember, often it is not ability, it’s reliability. The world is run by those who show up,” the author said in the book. Black first started writing a column because of a speech he had made at a meat club at the stock show. “I made my funny speech and a gentleman came up and asked me if I had ever thought of writing a column,” Black recalled. Black asked what the column would be about. The gentleman put his arm around Black and said, “What about us?” Pointing to all the cattlemen in the room. Black sent a sample, which they enjoyed. with only one trepidation. “What are you going to do when you get writer’s block?” they asked. “I am not going to get writer’s block,” Black replied. And he never has. Traveling the country and throughout Canada, over his career Black looks forward to writing in the solitude of the plane. People tell him a story, and he writes it down as he travels. But the Baxter Black poems and books have certainly worked out well for him, selling 890,000 books and a half a million DVDs, CDs and audiobooks. “I made a living being a veterinarian for 13 years. I was doing the entertaining on the side and it took over. 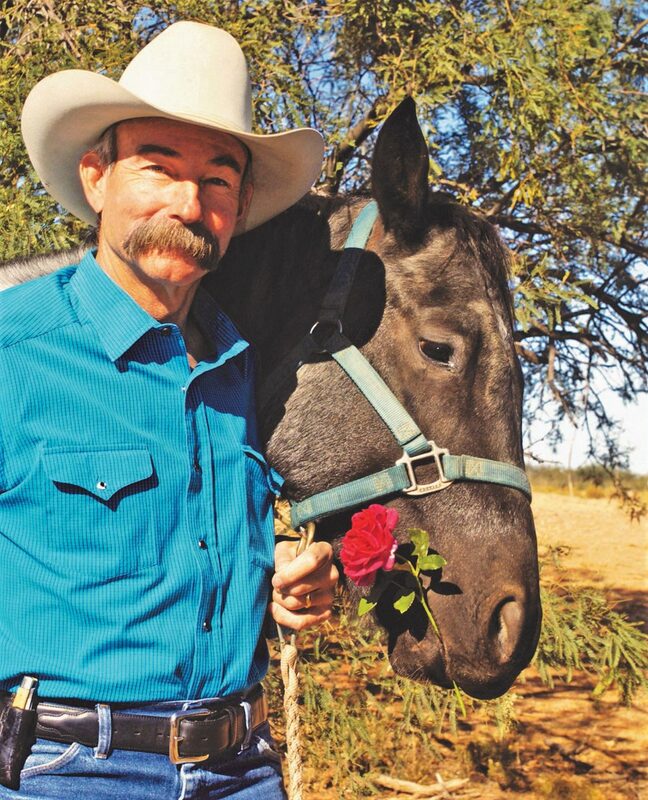 Cowboy poetry hijacked my career,” Black said. Located near the Mexico border, Black has 20 sections which he is leasing for a year. The clouds hang up on the mountains there, the soil is rich and it is excellent cow country, for a state that doesn’t get a lot of rain. It’s an ideal homesteading land for many ranchers. I asked Baxter if simple homesteading and cowboy poetry truly fit together. “Of course,” he exclaimed. “Here’s the thing — cowboy poetry is about wrecks. Because you are dealing with critters.” If a horse steps on your foot, because you are in the wrong place at the wrong time, you can make a poem about that. He told me that if your friend has a wreck with a tractor and it cuts off the person’s hand, that is not funny. But if a hog runs over you, a dog bites you or a horse bucks — that is a funny story worth telling. Recently Baxter was trying to push cattle into a gate. He was riding his horse and on this particular morning, which was a frisky morning, he put a spur into the horse, and the horse ran through a 20-foot high mesquite tree. And like David hitting Goliath with a sling shot, Baxter was hurled into the tree, with the horse going right through it, leaving Baxter hanging on a thorny limb. As an entrepreneur, Black says he must shoot a lot of arrows into the sky, with the hope of one sticking. All of his material can be shared with your 5-year-old or your Baptist aunt. At the end of the ceremony, with Black’s notes crumpled up in his hand, Black walked across the stage to shake Gov. John Hickenlooper’s hand. As he shook Hickenlooper’s hand, he pretended he just received a note from the governor. Black hurried back to the mic. “I have one final announcement,” Black said. “The governor wants me to say he has an uncle in the audience and that he is 111 years old. The audience starts to applause and look around.